MaxVeloSSD Highest performance SSD caching with additional RAM. 30 day Trial, available in 4 Editions. Personal, Professional, Enterprise and DataCenter. Accelerate Applications, maximize IOPS and MBPS on any size Data or System Volume. Use any size SSD to assign total or partially as cache, an integrated RAM Cache boosts performance beyond SSD. Compatible with all new and recent Windows x86/x64 plattforms. MaxVeloSSD RAM and SSD Cache Software from EliteBytes Limited Summary MaxVeloSSD is based on the reliable and high-performance VeloSSD Software. With the addition of unique fast RAM caching it opens the door to a new dimension of storage velocity. Breaking the bottlenecks of PCIe and SATA specifications it easily outperforms SSD speeds. MaxVeloSSD is faster than VeloSSD and SSD. It is a 2 level caching System, with a level 1 cache made out of system memory ( RAM) and a level 2 cache made out of SSD space. Designed to deliver ultimate caching speed it has reached its goal. Continuous Research, Development and Test. This software supports now up to 2 Petabyte Host Volumes. It requires only little RAM to manage Caching of these high Capacities. Compared to earlier Versions of this product the RAM footprint was reduced by more than 95%. Change History MaxVeloSSD Changes in Version 3,0,0,21 Thoroughly tested under Windows 10. Bugs with multiple cache Data Volumes removed. Bugs in the Cache engine were removed. Bugs with recovery after power loss were removed. Recovery is now quicker, especially when the write cache is filled up. Earlier versions needed to write the Write Cache back completely before boot. That could result in frustrating long boot times. Internal corruption due Power loss / reset occurred every once and a while. This is fixed. If an internal on disk structure is corrupted ( possible write error while loosing power ) fallback failover recognizes and replaces it. Changes: Windows 10 and 8.1 compatibility. Better stability, compatibility and performance. lower RAM footprint on big Volumes. Support for Volumes up to 2 PetaByte ( 2048 TB ). 30 day trial support. Minimum requirements: 1 Harddisk, 1 SSD, 3GB RAM. Press release: MaxVeloSSD delivers highest performance SSD caching with additional RAM. 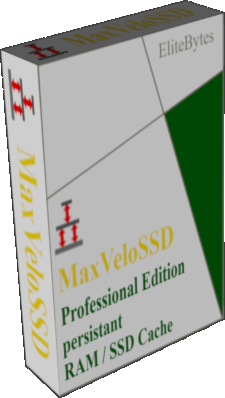 MaxVeloSSD delivers highest perfomance SSD caching with additional RAM. It outperforms other, even hardware based, caching solutions. Compatible with all x86/x64 Windows platforms since XP. Any storage Volume and up to 16 TB SSD cache. EliteBytes is an independent software vendor. One of its software products is: VeloRAM. Copyright 2015 - 2018.All rights reserved. Trade Mark. The Software VeloRAM may be freely distributed over the internet in an unchanged form.